Hogs Back’s Biker has been launched by Hogs Back Brewery as their new seasonal ale that celebrates the British love of riding a bike, as well as marking the Surrey-based brewer’s support for the annual Farnham Bike Ride charity event. Biker is a light, refreshing golden beer with floral and citrus hints and is big on flavour, despite having an ABV of just 3.4%. Brewed with Aramis aroma hops from France and American Amarillo hops, Biker reflects the growing consumer trend for lighter, mid-strength craft beers that provide refreshment and flavour with a lower alcohol content. Competitors in the Farnham Bike Ride on Sunday 2 July will be able to enjoy a free sample of Biker from the Hogs Back pop-up bar at the end of the course. The cycle ride, organised by Farnham Round Table, includes a range of routes from a relatively gentle 16-mile circuit to a more gruelling 75-mile sportive. 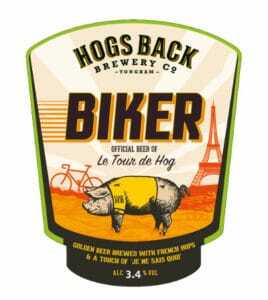 Among the riders will be a three-strong team from Hogs Back Brewery; Liam Davies, Andrew Thompson and Nigel Hyde. Hogs Back will be sponsoring them to finish the ride with a donation to Mind, which is the beneficiary of the company’s Charitable Trust for the year. With all the routes starting and finishing in Farnham town centre there will be plenty of opportunities for spectators to follow the action while enjoying a glass of Biker or another Hogs Back beer. Pubs stocking Hogs Back beers include The Wheatsheaf and The Nelson Arms in central Farnham and The Poacher in South Wanborough, on the 50-mile route. 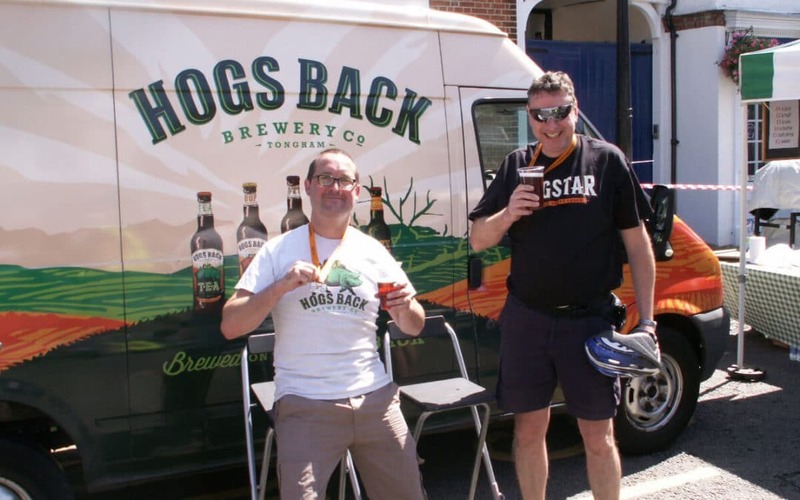 Rupert Thompson, managing director of Hogs Back Brewery, sad: “We are very well known around Farnham for the customised Hogs Back Brewery motorcycle and sidecar, but with Biker weare celebrating the popularity of pedal power. It’s a great summer ale for a great summer pastime. 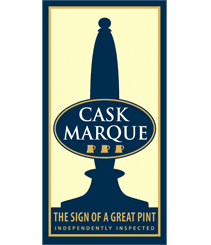 Biker is part of Hogs Back Brewery’s seasonal cask ale programme and will be available to pubs throughout July, as well as on draught to take away from the Hogs Back shop at the brewery in Tongham.